The chairs Bogi and Almar were premiered at DesignMarch 2012 in Reykjavík, Iceland. The prototypes were made in February and March by the designer who daily posted news and photos of the ongoing work on Facebook. All who had followed were then invitet to meet up with the chairs at the exhibition in The Maritime Museum, where they could try them out for design and comfort and also meet the new Aría table. Here are some of the Facebook photos again. Stólarnir Bogi og Almar voru frumsýndir á HönnunarMars 2012. Hönnuðurinn gerði sjálfur frumsmíðina í febrúar og mars 2012. Á meðan á henni stóð voru myndir og og upplýsingar sendar daglega á Facebook og fólki boðið að fylgjast með framgangi verksins. Að lokum var svo boðið til sýningar í Sjóminjasafninu. Tilgangur hönnuðarins var að gefa fólki kost á að skyggnast á bak við tjöldin og komast í nánara samband við munina sem það hafði kost á að skoða á sýningunni. A technical drawing of a chair is just that - a technical drawing. Only when a chair has been made from the drawing do you know if it works. Most of the time it will not work exactly as expected. In all its simplicity a chair is a complicated object. You feel its existence in space, sense the properties of the materials, touch it and evaluate its properties for aesthetics and comfort. The prototype will reveal some of this and allow the designer to move on with his chair - prototypes are the designers clay. Stóll sprettur ekki fullkláraður upp af teikniborðinu. Mikil hugmyndavinna liggur að baki hans þegar hafist er handa við gerð vinnuteikninga. Vinnuteikningin er svo grunnur smíðinnar sem gerir stólinn áþreifanlegan með öllum kostum og göllum, sem þarfnast áframhaldandi vinnu. Það er ekki víst að þægilegt sé að sitja í honum þrátt fyrir að í hugmyndavinnunni hafi allt verið gert til að svo yrði. Þrívíddin og ekki síst snertingin við stólinn getur einnig orðið allt önnur en lagt var upp með. Kannske virka samskeyti ekki eins og búist var við og efnið heitara eða kaldara við snertingu. Það er að mörgu að hyggja. Top left: A double mould was made to shape the back from plywood. / Mót var smíðað til að líma saman bakið úr krossvið. 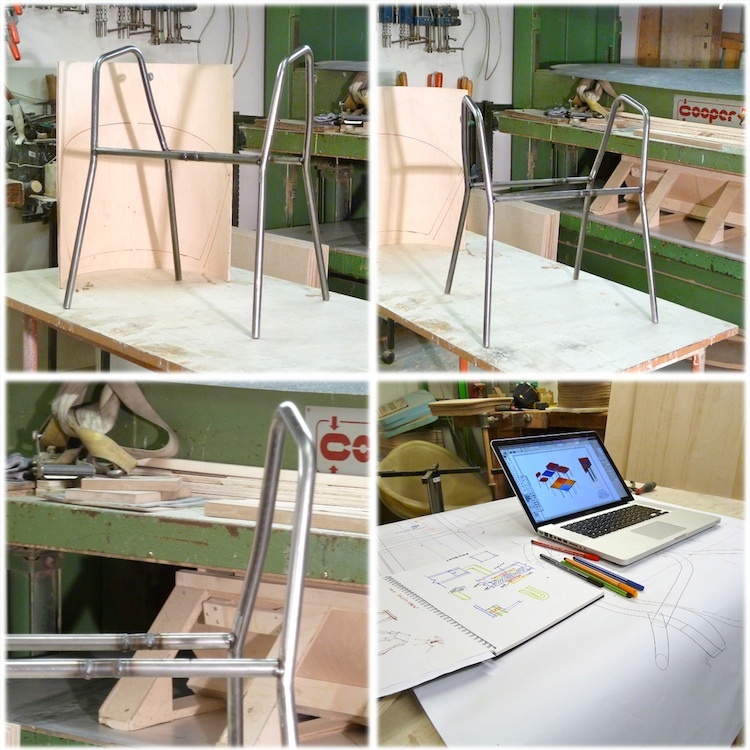 Bottom left: At last the final prototype is ready, an exiting moment / Og loksins er fyrsta frumsmíðin tilbúin. Top middle: Experimenting with shapes and fitting the back onto the frame. / Nokkur bök prufuð og hið útvalda fest á grindina. Bottom middle: The back. / Bakið. Top right: For comfort 3 sm were added to the frame width. Everything is now ready for final assembly. / Breiddin var aukin um 3 sm til að gera stólinn þægilegri. Bottom right: And here is the finished product, ready ti go to an exhibition! / Og hér er Bogi orðinn að alvöru stól og tilbúinn að fara á sýningu!